The Derby della Mole, the Turin derby, on Sunday was a tense and feisty clash where Juventus emerged victorious. Juve were superior in many ways but Torino have proven hard to beat under Walter Mazzarri, in fact this was their first loss under the new coach. It was an intriguing game where Juventus and their coach Massimiliano Allegri impressed. In this piece I’ll look at three big tactical take-aways; Douglas Costa’s role as a centre-forward, Juventus’ pressing and the strong performance from Alex Sandro. Mazzarri has mostly used a 4-3-3/4-5-1 so far but changed slightly by changing his midfield triangle from 1-2 to 2-1 with Joel Obi and Tomas Rincon behind Daniele Baselli. This was done in order to match the positions of Juventus’ midfield triangle as Toro would man-mark Juventus’ midfielders. Mazzarri had Salvatore Sirigu in goal, Lorenzo De Silvestre, Nicolas N’Koulou, Nicolas Burdisso and Cristian Molinaro in defense, Obi, Rincon and Baselli in midfield with Iago Falque and Cristian Ansaldi down the wings and Andrea Belotti in attack. The deployment of the defender Ansaldi on the left of attack highlighted Mazzarri’s ideas going into the game. Allegri has major injury problems especially in attack with Mario Mandzukic, Juan Cuadrado and Paulo Dybala (albeit on the bench) missing at the start of the game. This led Allegri to a front three of Douglas Costa on the right, Gonzalo Higuain centrally and Alex Sandro on the left. In midfield Allegri chose Stefano Sturaro’s battling ability next to Miralem Pjanic’ genius and Sami Khedira’s running while the back four consisted of Mattia Di Sciglio, Daniele Rugani, Giorgio Chiellini and Kwadwo Asamoah in front of Wojciech Szczecny. Contrary to Mazzarri’s deployment of a left-back in attack, Allegri’s deployment of Alex Sandro proved inspired. After only fifteen minutes, Juventus had a major setback as Higuain had to go off injured. With Dybala not ready to play 75 minutes and no other striker on the bench due to Mandzukic’ injury, Allegri opted to bring on Federico Bernardeschi on the right wing with Douglas Costa moving into Higuain’s central role. This was interesting in many ways. First of all, Costa’s profile is extremely different to Higuain’s superb target play and well-timed runs in behind. Costa is a fantastic dribbler and crosser who normally keeps a wide position down the touchline. Deployed centrally, he had to change that style of play. Second of all, Costa’s deployment centrally with Bernardeschi on the right and Alex Sandro on the left created a very fluid and flexible front three. 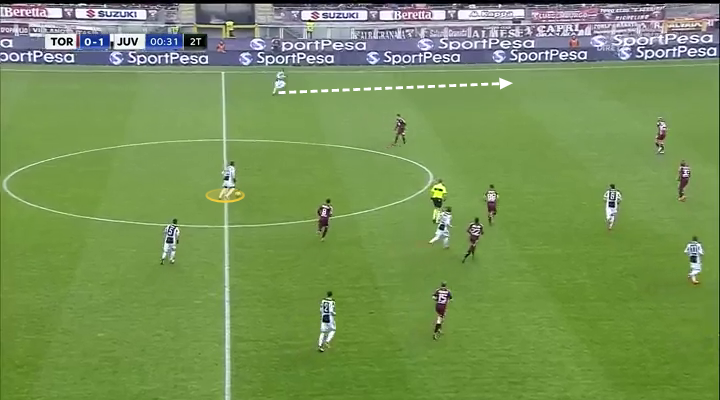 Straight away, Costa started to help Juve overcoming Torino’s strongly man-orientated midfield marking. In the example below, Costa drops off the defensive line into the space between the lines to receive a pass from Pjanic. Costa’s dropping movements created a situational diamond in midfield which helped Juventus progress the ball past Torino’s midfield line. Here’s another example, Rugani is on the ball and looks for Costa but plays the ball wide on this occasion. As you see, Baselli marks Pjanic, Rincon marks Khedira and Obi marks Sturaro while Costa looks to make himself an option to receive between the lines. Costa is just out of shot in the image below when Rugani finds him in space centrally after the horizontal movement of Sturaro has dragged Obi away from the central area which creates a huge space between him and Rincon who focuses on Khedira. On other occasions, Juventus used the sublime movement of Bernardeschi to progress the ball. He excels at coming off the flank to find space in the half-space behind the opponents’s midfield. Here Obi has been dragged away by Sturaro once again, which creates the space for Bernardeschi to identify and Rugani to find him in. Bernardeschi is naturally a number 10 while Costa is a winger, which had the effect of the two often changing positions. What was interesting was also the movement of Sandro which I’ll come to later. The movement of the front three created a fluid and flexible attack which created problems for Torino to handle. Below we see how Bernardeschi (black) has moved centrally while Costa has gone wide right with Sandro attacking the penalty area. To conclude this part, Costa’s deployment as the centre-forward changed the dynamic of Juventus’ attack and was key in helping them overcome Torino’s pressing. His dropping movements to receive was key in that regard, as were Bernardeschi’s inverted movement. Another important facet of Juve’s possession approach was how Khedira and Sturaro often made deep runs down the half-spaces besides Costa to further drag Obi and Rincon out of possession. Like Mazzarri, Allegri also opted for man-orientated pressing. Torino are by no means one of Italy’s best at building from the back, but they want to be protagonists in their matches and Juventus effective pressing removed that option as Toro struggled to progress the ball forward. Below you see the basic setup for the first line of pressing. The ball-near winger presses the full-back while the striker takes the ball-near centre-back. Depending on which side the ball was one, Khedira and Sturaro would press Toro’s dropping midfield player, normally Rincon. The ball-far winger, in this example Bernardeschi, is ready to press the ball-far centre-back. The objective was to force the ball wide and win it there. If the ball was played back to the goalkeeper Sirigu, Costa as the centre-forward would continue his pressing action with a curved run to prevent a pass to the centre-back he previously pressed. In this example you can see how they’ve steered the ball wide and how they commit men forward in the press. Here Sturaro has pressed the goalkeeper and Costa is now pressing Burdisso down in the left corner. Bernardeschi and Khedira give protection to the press and acts as a second line to make sure the press is organized and not in vain. When defending inside their own half, Allegri’s side changed to a more positionally-orientated system where they dropped into a 4-5-1 shape and focused on minimizing space between the lines and to block of the central areas. Once again highlighting how compact and tight Juventus were. Torino struggled to create any good chances against Juve’s effective deep block, partly due to their inability to keep the ball inside of Juve’s block, as you see here, they have no players within Juventus’ shape. The effective pressing and compact low-block defending ensured Torino struggled in possession and rarely threatened Wojciech Szczesny in goal. Add in a superb individual performance from Daniele Rugani against Andrea Belotti and it’s clear Juventus defending was superb. Alex Sandro has impressed in the last couple of season’s at Juve with his attacking play, whether as a left-back or wing-back. Against Toro, Allegri used the Brazilian as his left winger and Sandro was superb and got the only goal of the game. What really impressed about his performance was his understanding of space and his superb inverted movement into the left half-space. This movement was key in his effective combination with left-back Kwadwo Asamoah who bombed on down the flank. Below, Sandro has come inside and opened up the flank for Asamoah. He receives a pass from Chiellini and instantly lays it off to Asamoah who attacks down the left. Here’s another example, as Juve has built up on the right, Sandro drops into midfield to help switch the point of attack and does so by releasing Asamoah down the left. This combination between the two was very impressive and they linked up superbly. Alex Sandro became even more crucial to Juventus’ attack when he scored the only goal of the game. First he picked up the ball in the left half-space and played it wide right to Bernardeschi. As the Italian prepares to take on Molinaro, Sandro starts a run towards the back-post. Bernardeschi beats the left-back and fires a low cross across the face of goal where Sandro now finds himself and pounces from close range. It’s also worth noting that Costa now finds himself far left with Sandro attacking the central area as well as Sturaro and Khedira, which further highlights the fluidity of Juve’s front three. Considering Alex Sandro normally plays at left-back, it was a very impressive performance from the Brazilian in a more attacking and freer role. He impressed in his understanding of space and his combination play with Asamoah, and also displayed a poacher’s instinct when scoring the goal from one of his runs into the box. Finally, Juventus won the derby della Mole because of their superb defensive organization and Allegri’s inspired decision to deploy Costa up front while allowing the front three to change positions between themselves. Juve were good in all aspects of the game, and Torino found it tough against their city rivals. It was Toro’s first defeat under Mazzarri, but they remain a better team now than before he took over. Against Juve and the tactical ability of Allegri though, it proved to difficult.